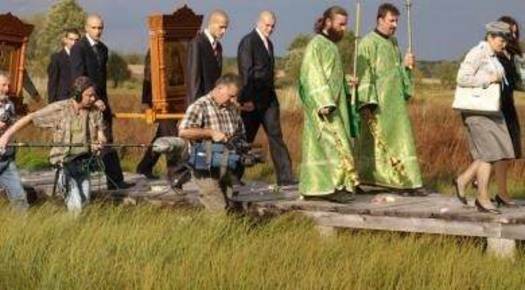 Another Award for a Movie Entitled "Archimandrite"
The documentary film “Achimandrite” directed by Jerzy Kalina has won of the International Documentary Film Festival and Television Programme “Radonezh” in Moscow. “Radonezh” is the oldest review and contest of the film productions about religion in Russia. It takes place under the patronage of Patriarch Kirill and Prime Minister Dmitry Medvedev. In the competition among TV productions, “Archimandrite” was the only film from Poland. This is the seventh prize for the film about Father Gabriel, a monk from Podlasie, who has built the only one Orthodox hermitage in Poland in the village Odrynki on Narew river bank. Archimandrite Gabriel is the founder and sole inhabitant of a hermitage in the Kudak wilderness on the river bank of Narew. For the first few years he lived there alone and prayed in a portacabin, without electricity, running water, completely cut off from the outside world. After some time, with the help of local Orthodox villagers, on the wilderness stood the wooden church, small monastery and outbuildings. Today this place is visited by dozens of pilgrims. They are attracted by the extraordinary personality of Archimandrite Gabriel. With each he can find a common language, provides spiritual counseling, heals with herbs, breeds bees, and when necessary, pitches up and along with the other builds a hermitage. But will it be forever? Will the hermit find their successor in his life? The next candidates for the monastic life in the hermitage cannot withstand long … They cannot live without comforts, the gains of civilization and contact with peers. Jerzy Kalina’s film is more than a story about an exceptional man and his work. In the lazy Narew currents no less than crosses of Orthodox skithe our globalized world is reflected, facing away from spiritual values, craving for money and exchange of information. The strength of “Archimandrite” is that the author has managed to simultaneously touch of the local, rooted in the Belarusian-Orthodox Podlasie microcosm and universal values, fundamental in human life, regardless of age and his place in the world. For many Polish viewers this picture is also a surprising discovery of the richness of cultures and religions of our eastern border. Golden Melchior in the category “Inspiration of the Year” All-Poland Reporter’s Competition MELCHIORY 2012 by Polish Radio.